Hailing from the small town of Escatawpa, MS, near Biloxi, 3 Doors Down was formed in 1994 by Brad Arnold, Matt Roberts, and Todd Harrell and forged a major-label contract using popular live shows and the reputation of a single song. Soon, the band added guitarist Chris Henderson. Their hit, “Kryptonite,” generated unprecedented buzz at local radio station WCPR in Biloxi, helping to make them hometown favorites and enabling them to draw relatively large crowds to their local live shows, which consequently, helped them extend their range beyond Mississippi and the deep south to internationally famous clubs like New York’s CBGB’s. he CBGB’s show brought them to the attention of Republic Records, a subsidiary of Universal, which issued the band’s major-label debut, The Better Life, in early 2000. Away From the Sun arrived in November 2002 – it debuted at number eight on the Billboard Top 200 and soon went gold. 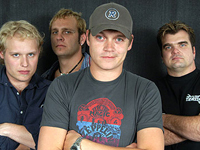 Three Doors Down toured steadily throughout 2003 and 2004 in support of Away From the Sun, and issued the live EP Another 700 Miles in November 2003 as a holdover between studio efforts. The group returned with the LP Seventeen Days in early 2005. It debuted at number one on the Billboard 200, and went platinum in its first week of release. The band has since sold well over 13 million albums in the United States alone since their debut album, The Better Life, was released in 2000. They also perform more than 300 concerts a year and have performed with other well-known artists such as Lynyrd Skynyrd, Staind, Nickelback, Alter Bridge, Breaking Benjamin, Seether, Shinedown and Daughtry. Brad Arnold is the vocalist for the band and played the drums on their debut CD The Better Life. He started singing full time for the band after a concert where no one else would sing except for him and he ended up enjoying it. The Better Life was released on February 2, 2000 and has since been certified 6 times Platinum thanks to the international hit singles, “Kryptonite”, “Loser”, and “Duck and Run”. The song “Be Like That” was rerecorded for the 2001 film American Pie 2, with alternate lyrics for the first 2 lines. This version is known as “The American Pie 2 Edit”. The band’s second studio album, Away from the Sun, was released in 2002 and since been certified 4 times Platinum in the United States and Platinum in Australia. “Here Without You” and “When I’m Gone” proved to be the most successful singles from that album. “The Road I’m On” and “Away from the Sun” also charted with less success. Session drummer Josh Freese contributed drums for Away from the Sun. Also, Rush guitarist Alex Lifeson produced and played on 3 tracks for the record, “Dangerous Game”, “Dead Love”, and “Wasted Me” (only “Dangerous Game” appeared on the album). The band hired Daniel Adair to play drums on the Away From the Sun tour. Since 2003, the band has held “3 Doors Down and Friends” benefit concert, through the band’s own charity The Better Life Foundation. In 2006, the event was held Dec. 2, at the Mobile Convention Center, with proceeds to benefit Hurricane Katrina survivors. The band released a live E.P. in 2003 which consists of part of a live performance by the band on their Away from the Sun tour in Chicago. Another 700 Miles has since been certified Gold in the US. The band’s third album, 2005′s Seventeen Days, has since been certified Platinum. “Let Me Go” and “Behind Those Eyes” charted with the most success. “Live for Today”, “Landing in London” (on which Bob Seger provided back-up vocals and guitar), and “Here by Me” were also released as singles. During the Seventeen Days tour, the band appeared alongside the southern rock band Lynyrd Skynyrd. Also in 2005, the band released a live DVD titled “Away from the Sun Live from Houston, Texas”. The DVD was produced and directed by Academy Award nominated Alex Gibney and Doug Biro. Greg Upchurch, formerly of Puddle of Mudd, is the drummer who replaced Daniel Adair in 2005. Adair left to be the drummer for Nickelback. According to the band’s website, they had completed recording a new studio album that is self titled. This was confirmed in an interview with the band conducted on December 28, 2007 by the Las Vegas Sun. The official track list of the album was first listed on amazon.com. The video for a track titled “Citizen/Soldier” is featured on the National Guard Recruiting Site and has been shown during the previews at several American movie theaters. The song “Citizen/Soldier” was also released as a single in 2007. NASCAR Driver Dale Earnhardt Jr. also drove a car promoting the new CD with “Citizen/Soldier” on the hood at the May 17th All-Star Event. On 3 Doors Down’s message boards, a release date of May 20 had been confirmed by frontman Brad Arnold, with “It’s Not My Time” as the first single having been released February 19 and already having success on the American rock charts, having held the #1 position for three weeks on the US Mainstream Rock chart. The song can currently be listened to on the band’s MySpace page. The new video for “It’s Not My Time” is now available online. 3 Doors Down leaked onto the internet on the 10th of May, the same day of their Earth Day Birthday concert at Tinker Field in Orlando. On 23rd May 2008 3 Doors Down announced on their website and myspace they are postponing their upcoming european tour until a later date. The tour was scheduled to kick off the the U.K. on May 30th and run through mid-June.